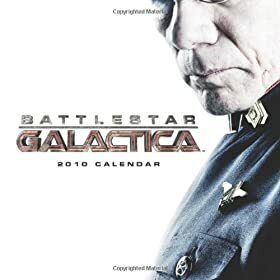 Offering Battlestar Galactica Season 4 Season 4.5 Season 4.0 Season 3 Season 2.5 Season 2.0 Battlestar Galactica Season One Battlestar Galactica Miniseries Battlestar Galactica DVD and more with easy online ordering. 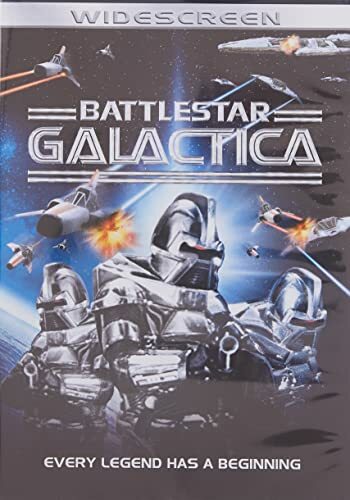 "The adventure of one of television’s finest dramas continues with Battlestar Galactica: Season Three, from the immensely popular SCI FI Channel series and Peabody Award-winning Battlestar Galactica. The Colonies’ survivors have found their hopes of eluding their Cylon pursuers dashed by an invasion and occupation of their new home. As the fate of all human life hangs in the balance, friends become enemies, enemies become unexpected allies, and decisions are made that will haunt some people for the rest of their lives. Relive all 20 episodes of the season that challenges everything you thought you knew about the Battlestar Galactica universe. Presented in Dolby 5.1 surround sound, the 6-disc set features over 15 hours of extensive special features, including the DVD exclusive extended version of the episode "Unfinished Business" containing 25 additional minutes of never-before-seen footage. David Eick’s Video Blog for episode Takin’ A Break From All Your Worries On the Road: Part 2, Some Guy Named Colin, Building a Better Show, Katee’s Scrapbook"
The first half of Battlestar Galactica's second season left no doubts about the continuing excellence of the best science fiction TV series of 2005. Beginning with the Colonial Fleet separated, Col. Tigh (Michael Hogan) botching his temporary command, and Capt. 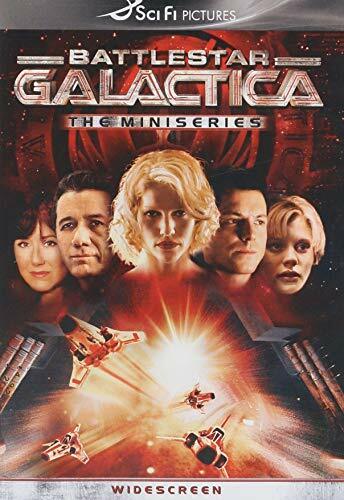 Adama (Edward James Olmos) near death after a Cylon assassination attempt, series producer/developer Ronald D. Moore and his gifted writing staff packed more into these 10 episodes than most series manage in a full season. Maintaining its reputation as an adult drama, the series is compellingly anchored by the gravitas of Olmos and Mary McDonnell, whose role as Fleet President Laura Roslin grows more complex as she reveals her diagnosis of breast cancer and defies Adama, playing the "religious card" with her conviction that prophetic visions will lead the embattled fleet toward its legendary home planet Earth. As Adama's son Apollo (Jamie Bamber) wrestles with his role in Roslin's mutinous agenda, paranoia runs high as Cylon copies (or "avatars") of Boomer (Grace Park) complicate matters aboard Galactica and on Kobol, where a lost Raptor crew struggles to survive and Dr. Baltar (James Callis) endures the increasingly haunting and manipulative intrusions into his tormented psyche by Number Six (Tricia Helfer), the seductive Cylon who holds the secret to the Cylon master plan to destroy humankind. 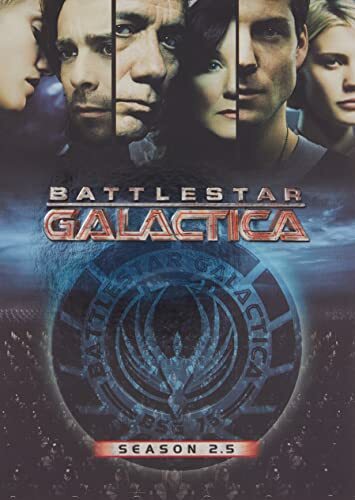 Despite voluminous protest and nitpicking criticism from loyal fans of the original 1978-80 TV series, the 2003 version of Battlestar Galactica turned out surprisingly well for viewers with a tolerance for change. Originally broadcast on the Sci-Fi Channel in December 2003 and conceived by Star Trek: The Next Generation alumnus Ronald D. Moore as the pilot episode for a "reimagined" TV series, this four-hour "miniseries" reprises the basic premise of the original show while giving a major overhaul (including some changes in gender) to several characters and plot elements. Gone are the flowing robes, disco-era hairstyles, and mock-Egyptian fighter helmets, and thankfully there's not a fluffy "daggit" in sight... at least, not yet. Also missing are the "chrome toaster" Cylons, replaced by new, more formidable varieties of the invading Cylon enemy, including "Number Six" in hot red skirts and ample cleavage, who tricks the human genius Baltar into a scenario that nearly annihilates the human inhabitants of 12 colonial worlds. In the deepest reaches of space, the fight to save all human life from extinction has begun in this science fiction adventure that launched the Battlestar Galactica phenomenon! Hopeful for lasting peace following centuries of intense warfare, the Twelve Colonies gather to sign a treaty with their dreaded enemies, The Cylons. But after an act of treachery on the eve of the ceremony, the Cylons launch a devastating surprise attack, destroying the Colonies' home planets and most of their military strength. A lone flagship battlestar, the Galactica, remains to aid the surviving colonists on their epic journey for a new home to a far-off legendary planet -Earth. 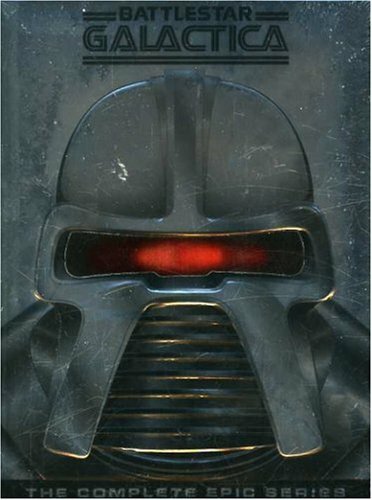 They must survive the pursuing Cylons in a series of epic battles that will determine the fate of the human race in this non-stop action-packed classic filled with cutting-edge special effects by John Dykstra ("Star Wars," "Spider-Man").